An in-home caregiver is a great solution for an elderly person who needs ongoing daily assistance and personal care. At home care is often the preferred choice for seniors who wish to age in the comfort of their own home. MoniCare refers professional non-medical caregivers with 2-10 years of professional caregiving or senior companionship experience. 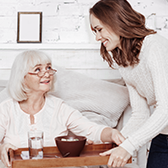 A professional, compassionate caregiver keeps the elderly socially engaged at home, helps with personal care, organizes and manages their household, runs errands and also accompanies them to visit friends, family, and other social events. NOTE: MoniCare does not place companions for seniors with medical conditions that require daily medical supervision. Our companions are not allowed to administer drugs or provide any other specialized medical assistance. MoniCare personal assistants in provide administrative support for business, personal, and family-related tasks. Typically, personal assistants work from an employer’s home office, but can also be based in a corporate office. They adapt to the needs of their employer, work well under pressure, and handle difficult situations with tact. Personal assistants have a diverse range of qualifications, as their job descriptions are tailored to the employer’s needs. MoniCare personal assistants have strong communication skills, proper social and business etiquette, and are discreet and trustworthy. MoniCare administrative assistants provide administrative support for business, personal, and family-related tasks. Typically, administrative assistants work from an employer’s corporate office, but can also be based in an employer’s home office. They adapt to the needs of their employer, work well under pressure, and handle difficult situations with tact. Administrative assistants have a diverse range of qualifications, as their job descriptions are tailored to the employer’s needs. MoniCare administrative assistants have strong communication skills, proper social and business etiquette, and are discreet and trustworthy. A family assistant provides administrative support for all household members. A family assistant can help a single person, a couple or a larger family to coordinate daily household activities, supervise outside services or other employees. Family assistants blend in well in the employer’s household, are discreet and respectful of the employer’s lifestyle and values. MoniCare represents family assistants with Bachelor's degree and professional experience in the household and fast-paced business settings. 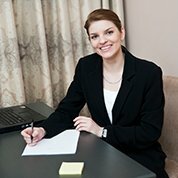 They possess strong writing and verbal skills, have excellent skills with computers and the Internet, and have fundamental accounting knowledge. Our candidates are creative and resourceful problem solvers with strong time management skills. A companion serves as a personal assistant and works from the employer’s home. MoniCare companion helps to organize the household and enjoy active social life.